So the price of everything is going sky high, and shows no signs of abating in the foreseeable future. Food certainly isn’t exempt. There are ways to lower that cost and have fun in the process, if you’re willing to put in a little effort. 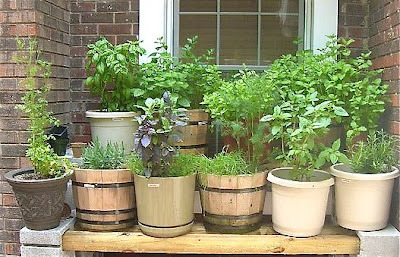 Everyone has heard of growing herbs on your patio or window sill, but have you ever thought about vegetables? 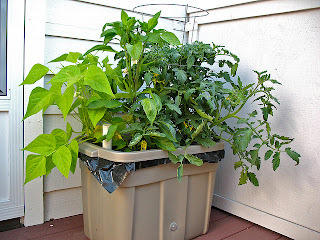 All you need is enough sun, minimal space, some pots or buckets, and decent soil. This means no potting soil. With the right combination of the above I have seen successful efforts even in garbage pails. 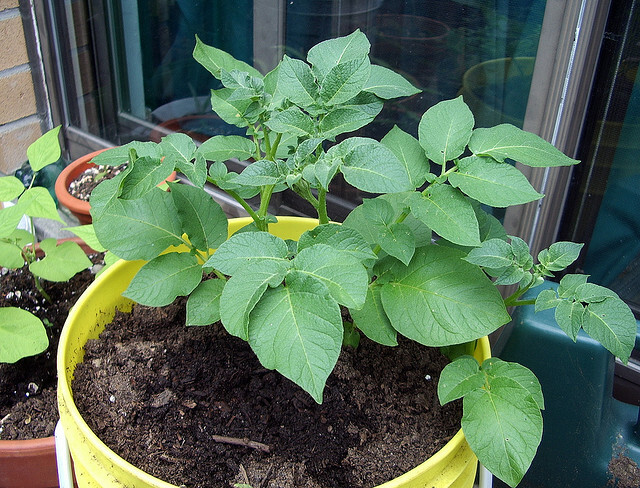 Potatoes, beans, peas, cucumbers, tomatoes, carrots, squash, lettuce… You name it you can grow it in a bucket under the right conditions. Even if not optimal you will still quite possibly get a crop, just perhaps not as bountiful or as early as if ideal conditions are met. So just what is garden soil? Drainage is of great importance. If you’re reading this in Nova Scotia, you will remember the past few summers as fairly wet. If your containers don’t have some sort of drainage (i.e., a hole cut in the bottom) you will encourage rot of either root or stems, or both. So make sure you take that into account. We have a grapefruit tree that we set out every summer in a pot with no drainage and am continually pouring off the accumulated rain from the top. It’s doing the plant no favours. Every plant need a certain amount of sun per day. Packets of seeds sometimes state what conditions are needed. If not you can easily find out via a web search. Some do well with minimal sun, others need nearly full sun all day. Choose your victims based on your own circumstances. 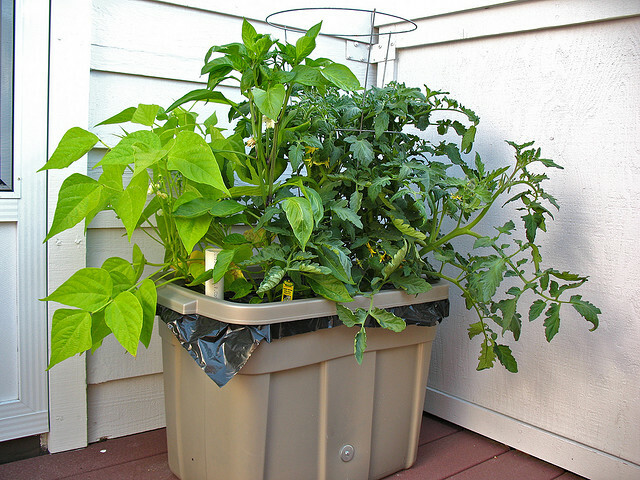 Choose your containers to suit what you’re growing. For example, potatoes will need a deeper bucket than lettuce. 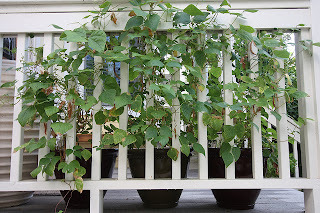 A little research on root systems (google what you want to grow) will let you know how deep and wide your container has to be to have optimal growth. Several different plants in one container. Some plants do well and support each other in growing. This process is called “intercropping.” For example, there is a common combination of corn, beans and squash grown in the same spot. The beans use the corn as a natural support. The squash covers the ground and keeps weeds at bay, and the beans fix nitrogen nodules at their roots which are used by all three plants. The three together also make an excellent succotash when it’s harvest time. Seed packets are not very expensive for your potential yield, but for some you don’t even need to buy seeds. For example, you can grow potatoes from pieces of potatoes from the grocery. Each piece should have at least a few “eyes” to increase your chances of a plant. For others, like squash, peppers and tomatoes, just save and clean the seeds from vegetables you buy. Yes, it Is that easy. Just make sure to use them within one year or less, or they lose viability. If you're interested in trying this, you should start your research now. Spring arrives in just over a week. Although here you have to wait for some time longer, you'll have the knowledge at hand as to when to start the vegetables you want to grow.